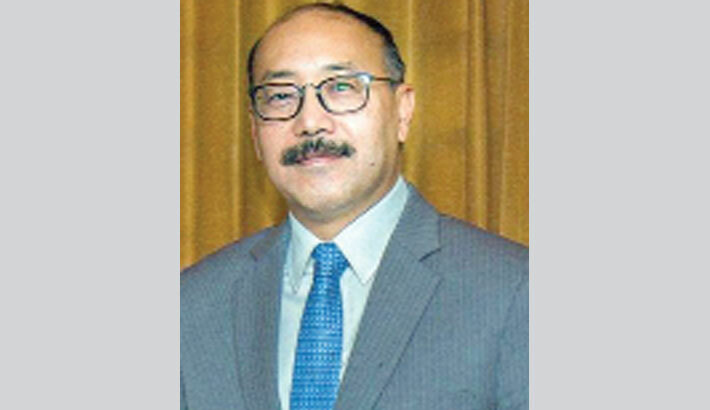 The bilateral relations between Bangladesh and India have reached a new height during the three-year tenure of Harsh Vardhan Shringla as the Indian high commissioner in Dhaka. Shringla arrived in Bangladesh in January, 2016. He is going to leave the country in January, 2019 after investing three years in boosting India-Bangladesh relationship. His focus in the years has been on all round development of bilateral ties between the two countries. He succeeded in making remarkable progress in areas of development partnership, connectivity, trade and investment, defence cooperation and people-to-people contact between the two nations. Shringla’s tenure also saw beginning of cooperation in uncharted territory of high technology, including nuclear, space, electronics and IT. Significant work has also been done in enhancing cooperation in areas of environment, social development, community welfare, improvement of infrastructure at the borders, including the Border Haats. Shringla has also worked on reducing the India factor in Bangladesh politics - particularly during national elections. Most significant achievement during his tenure has been the great boost given to people-to-people contact. And this has been made possible by a number of initiatives launched by the envoy to make cross-border movement of people easier and faster. In the last three years, some of the notable measures taken in this regard included liberalising the visa regime to issue five-year multiple entry visas to Bangladeshi freedom fighters and senior citizens, multiple entry tourist and business visas of maximum permissible duration, organisation of special visa camps on the occasion of Eid (May-June 2016) and for students (October 2016) and Armed Forces personnel (February 2017). During Shringla’s tenure, moves were also taken towards a completely appointment-less system under which applicants can deposit applications on a walk-in basis as securing online appointment for submitting Indian visa applications was a major issue for many Bangladeshi nationals, while special counters for senior citizens and freedom fighters were set up and policy of special consideration for women applicants, cashless transactions to reduce turnaround time, assistance through various channels, including social media and hotline service, etc were also introduced during the period. To further streamline and facilitate the visa application process, the largest Indian Visa Application Centre in the world was inaugurated during the visit of the Indian home minister to Bangladesh in July, 2018. Shringla’s tenure has also seen an enhancement in connectivity between the two countries. Launch of end-to-end immigration and customs on Maitree Express between Kolkata and Dhaka have reduced traveling time and added to passenger comfort. New passenger train and bus services between Kolkata and Khulna have also given a boost to cross- border movement of people. Over the last three years, Shringla has travelled extensively across Bangladesh, covering practically all the districts, in order to meet the people and understand the rich cultural heritage of Bangladesh better. During his tenure, Dhaka and Delhi witnessed many high level interactions, including visit of Indian Prime Minister Narendra Modi to Bangladesh in June 2015 followed by visits of the Indian ministers of defence (first ever visit of an Indian Defence Minister to Bangladesh), finance, external affairs, home, petroleum, commerce and civil aviation. There were 10 meetings between Narendra Modi and his Bangladesh counterpart Prime Minister Sheikh Hasina, six video conferences, and five telephone calls during the period. Narendra Modi and Sheikh Hasina jointly inaugurated 19 development projects. Settlement of India-Bangladesh land and maritime boundaries, pending since 1947, and signing of over 90 bilateral agreements in new areas such as space, IT, electronics, cyber security, civil nuclear energy, shipping, etc. were remarkable progress during his tenure. In the last three years, India’s development assistance to Bangladesh expanded from $3 billion in 2015 to $8 billion, while projects fully funded by the India government worth Tk 1500 crore are under implementation. Meanwhile, trade between the two countries increased by 31.5 percent from $ 7 billion to $ 9.3 billion and Bangladesh’s export to India was growing at a rapid pace (106.4 per cent in 2017-18). Indian export to Bangladesh grew by 26.3 percent in 2017-18, Indian investments in the pipeline in Bangladesh increased from $3 billion to $10 billion, and Bangladesh has emerged as India’s largest trade partner in South Asia. During the period, four of the pre-1965 rail link between India and Bangladesh was made operational and the remaining two will be operational by 2019. The period is marked by three new railway links between India and Bangladesh under implementation, launch of end-to-end customs and immigration services for Kolkata-Dhaka Maitri Express, launch of Kolkata-Khusna train service, new bus services between Kolkata and Khulna, Dhaka and Shillong / Guwahati, commencement of coastal shipping services between Kolkata and Pangaon and other ports of Bangladesh, and 24x7 movement of cargo services at Petrapole-Benapole. Energy cooperation has also made a remarkable progress between the two neighbouring nations as they constructed India-Bangladesh Friendship Pipeline for diesel supply from India (Siliguri) to Bangladesh (Parbatipur). Bangladesh now gets almost 1200 MW of electricity from India, which is around 10% of power generation in Bangladesh. The period also witnessed construction of 1320 MW Rampal power plant and feasibility study to integrate LNG grids of India and Bangladesh. A total of 4,000 Bangladeshi civil service officers are trained in India, while training of 1,500 judicial services officers is underway, six batches of 100-member youth delegation went to India and 9,000 student visas to Bangladeshi students were granted during the period. One hundred Bangladeshi freedom fighter patients are being treated every year in Indian Armed Forces hospitals free of cost since 2018. Five-year multiple entry visas have been granted to around 2,000 freedom fighters from 2017 to date, while more than Tk10 crore has been disbursed under Muktijoddha scholarship and about 3,500 students have benefited from this scheme since 2015. Besides, over Tk 23 crore has been disbursed and more than 13,000 students have benefited from the scheme since its inception in 2006. ‘Nutan Bharat- Bangladesh Maitree Muktijoddha Santan Scholarship’ scheme was announced in 2017, and more than 21,000 Bangladeshi students will be benefited from the disbursement of Tk 52 crore through these schemes by FY 2021-22. Cultural cooperation between the two countries has also gained momentum as the period saw establishment of ICCR Chairs for Hindi and Urdu languages in the Dhaka University. More than 300 cultural events and seminars were held by Indira Gandhi Cultural Centre (IGCC), while more than 6000 Bangladeshi students were enrolled in various courses of the IGCC during the time. Civil nuclear cooperation between the two nations witnessed a giant leap as tripartite cooperation among India, Bangladesh and Russia happened for the Rooppur nuclear plant in Bangladesh. Besides, problems faced by Bangladeshi nationals in accessing Indian visa fully were resolved and there was a three-fold increase in visa issuance. India issued visas to 14.5 lakh people of Bangladesh in 2018, while the number was five lakh in 2015. In September 2018, a record number of 1,34,960 visas for Bangladeshi nationals were issued and the largest (18,500 square feet) visa application centre in the world was opened by Home Ministers of India and Bangladesh at Jamuna Future Park in Dhaka in July 2018. Restrictions against Bangladesh nationals visiting Sikkim, Laddakh, Arunachal and other protected areas were recently removed thanks to sincere moves by Shringla.